Tests proved that the C-A-T completely occluded blood flow of an extremity in the event of a traumatic wound with significant hemorrhage. The C-A-T utilizes a durable windlass system with a free-moving internal band providing true circumferential pressure to the extremity. Once adequately tightened, bleeding will cease and the windlass is locked into place. A Hook and Loop strap is then applied, securing the windlass to maintain pressure during casualty evacuation. 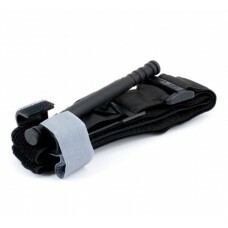 The C-A-Ts unique dual securing system avoids the use of screws and clips which can become difficult to operate under survival stress or where fine motor skills are compromised.